Welcome to the archives of Charice's Billboard Charts performance and other snippets of news. Read on and don't forget to Like this page! For corrections, please email me at admin[at]reyjr.com. Week of May 29, 2010 - Charice enters Billboard 200 at No. 8 and Pyramid featuring Iyaz enters Billboard Hot 100 at No. 56! I wanted to share with you that our very own Filipino YouTube sensation Charice Pempengco has just cemented her International Superstar status with a No. 8 debut on the Billboard 200 Albums after selling 43,000 copies of her self titled US debut album. The album "Charice" also enters Billboard Digital Albums at No. 8 and the Canadian Albums Chart at No. 4. The 18-year old vocal powerhouse visited “The Oprah Winfrey Show” with other YouTube phenomenon, Justin Bieber last week. The first cut off the album, “Pyramid feat. Iyaz” peaked at No. 1 on the Billboard Dance Songs last week (it is down to No. 12 this week), and she enter the Billboard Hot 100 this week at No. 56. Woot! The single is also No. 32 on Billboard Digital Songs and No. 41 on the Canadian Hot 100 Charts. Charice’s international media success on the Billboard charts is unmatched by any other solo Filipino artist - she was even recently interviewed by CNN for an article titled "Charice: The next Celine Dion?" Cool no? I am truly hopeful her success continues with more hits and more albums. Put that big voice to good use, and blow them all away, Charice! We are proud of you! The new Billboard Charts were just released. In its second week, "Charice" drops from #8 to #28 on the Billboard 200 Albums Chart. It also drops a same 20 places in the Canadian Albums Chart to land at #24. On the Billboard Hot 100 Chart, Pyramid feat. Iyaz drops from its #56 debut to #93. It remains strong in the Billboard Dance Songs Charts though holding on to the #14 spot. In the Canadian Hot 100, it drops from #41 to #73, but it also enters at #15 of the week's most-streamed video clips on AOL Music. In its 3rd week, album "Charice" drops further from #28 to #55 on the Billboard 200 Albums Chart and the first single off the album "Pyramid" feat. Iyaz drops out of the Billboard Hot 100. The song is still charting on the Billboard Dance Songs Charts, holding onto the #15 spot, and claims #77 on the Canadian Hot 100 Charts. So the rumours are still afloat that Charice will be joining the cast of Glee soon - what do you think about it? Do you like it? Do you think they don't need a new cast member? Now on its fourth week, album "Charice" lands at #81 from #55 on the Billboard 200 Albums Charts. On the other side of the river though, it zooms back up and re-enters the Canadian Albums Chart at #14 following a very successful series of shows in Toronto, Canada. On the Billboard Dance Songs Chart, it drops from #15 to #48, but on the Canadian Hot 100, it jumps back up 11 spaces to #66. It is Week No. 5 for Charice - the album which entered and peaked 5 weeks ago at #8 is down to #162 this week, dropping from #81 the previous week on the Billboard 200 Charts. Pyramid feat. Iyaz is still charting though on the Canadian Hot 100, holding on tightly to the 75th spot, although down from last week's #66. Will this be the final week for Charice on the Billboard Charts? When will she release a new single? Will her appearance this week on Regis and Kelly affect her Billboard Charts ranking positively? We hope so, but we'll find out next week! Album "Charice" is #173 on its 6th Week on the Billboard 200 Albums Chart slipping further down from #162 last week. On the singles charts, Canadian Hot 100, Pyramid feat. Iyaz is still on the charts at #77, down 2 places from last week. I am expecting a resurgence next week of her album sales - by how much, we can't say for sure. But definitely, after the announcement that Charice will be joining Glee next season, I am sure a lot of people will be curious about her. Watch out next week for Charice's Billboard Charts positions! It is an exciting 7th Week for Charice on the Billboard Charts! Her self-titled album jumped from #173 to #139 this week and is one of the titles with the greatest airplay and sales gain this week - thanks largely to the announcement of her participation in Glee come September when the 2nd Season begins. Last week over at Charicemania.com I had a short conversation around what Charice's character in Glee should be named - hopefully something Filipino sounding like Mayumi or something. Hehe. What do you reckon? Will her character even be Filipino? 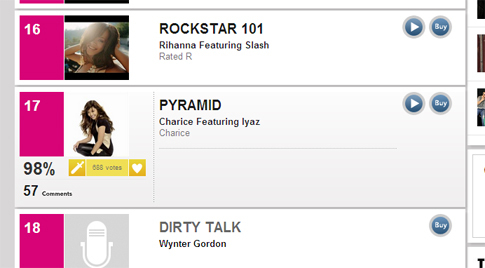 Anyway, Charice also debuted this week on another Chart - Pyramid feat. Iyaz debuts at the Top Spot on Yahoo! Video, a chart that lists the Top 10 most-streamed video clips for the week on Yahoo! Music. She was also featured on Billboard.com's Mashup Mondays singing Shania Twain's "You're Still the One". See the VIDEO here. 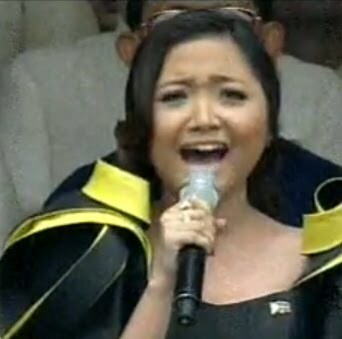 Also this week, Charice sang the Philippine National Anthem for the Inauguration of the new President of the Philippines, Pres. Noynoy Aquino. Billboard Hot 100 - "Pyramid" feat. Iyaz entered and peaked at #56, Week of May 29, 2010 then dropped to #93 on its second a final week. Billboard 200 Albums - "Charice" entered and peaked at #8, Week of May 29, 2010 and from there continued to chart for 6 more weeks - #28 - #55 - #81 - #162 - #173 and rebounded to #139 before dropping off the list. Dance/Club Songs - Pyramid is a Chart topper here, #1 in the Week of May 22, 2010 and stayed on this chart for a total of 9 weeks. Canadian Hot 100 - A total of 9 weeks on this chart, "Pyramid" feat. Iyaz peaked at #41. But while her Chart run has so far ended in the other Charts, she debuts on the Japan Hot 100 - Proving she's an international phenomenon, "Pyramid" entered this chart at #61. Do we expect another resurgence when Charice appears on the small screen come September? What do you think? Charice continues her Asian album tour as Pyramid shoots up to #8 on Billboard's Japan Hot 100 from #61 the previous week. This, following the release of "Sharisu", the Japanese version of her album. Charice also released her own version of Japanese pop singer, Ayaka's "Cresent Moon" (Mikazuki) in Japan. "Pyramid" climbs further up the Japan Hot 100 and is at #4 this week on Billboard's Japan Hot 100 Charts. Way to go Sharisu! Still going strong in Japan, "Pyramid" moves just one spot down to #5 this week on Billboard's Japan Hot 100 Charts. Moving 5 spaces down to land at #10 this week on its 5th week on Billboard's Japan Hot 100 Charts, "Pyramid" featuring Iyaz continues its Asian streak. Looking forward to September 21 when the first episode of the Second Season of "Glee" begins? Did you know that Charice is set to appear on that first episode? Well she is, so you better watch it! "Pyramid" featuring Iyaz clings on to the #21 spot on Billboard's Japan Hot 100 Charts, down 11 spots from last week. I was requested to include in the rundown here Charts from Malaysia and Thailand, but unfortunately they've only recently opened a Japan Hot 100 on the Billboard Charts. Maybe in the future they will broaden their charts to more countries. You are all welcome to update in the comments section how Charice is doing in the charts in whatever country you are from. Thanks! "Pyramid" featuring Iyaz drops to #57 from #21 on Billboard's Japan Hot 100 Charts for the week ending August 21. Now barely a month before her "Glee" debut, Charice is busy with shows all over the world, promoting her album - now with certified hits in Japan, Korea, Thailand and Malaysia. Way to go Cha! Don't forget the second season of Glee begins on September 21. Charice's first single off her album, "Pyramid" featuring Iyaz jumps back up the Billboard Japan Hot 100 Charts to #42 from #57 with excitement building up for her Glee appearance. Also this week, Charice's self-titled Japan Debut album is #14 on the Billboard Japan Albums. Charice is also featured in Billboards' Photos of the Week (POTW) hitting a high note at the "Back To School" show at Macy's at Herald Square in New York City on Aug. 15. Charice's first single off her self titled album, "Pyramid" featuring Iyaz is rising up the Charts in Japan again! It is #38 this week jumping 4 spots. "Sharisu" is on a roll! Also in Japan, Charice's self-titled Japan Debut album is #6 on the Billboard Japan Albums, up from 14 last week. We have also found out that Charice character in Glee will be named "Sunshine Corazon". What do you think of that name? Sunshine is a not uncommon Filipino name, and Corazon is a Spanish word meaning "heart". Seems to me the character is a goody happy character. It also opens up possible song numbers with the word "Sunshine" in them like "I'm walkin' on sunshine" or "I got sunshine on a cloudy day..."
"Glee Season 2 begins September 21"
Bummed that Charice drops out of the Charts this week. But no worries because I think she'll be back on the charts sooner than you think! Charice is back on the Billboard 200 Albums Chart following the repeat showing of one of Charice's appearances on "Oprah" with 240% gain. Watch it continue to rise up the charts with the Glee premier party this week and the start of Glee Season 2 on September 21. Album "Charice" drops out of the Billboard 200 Albums this week (although I think not for too long) just as "Pyramid" re-enters the Japan Hot 100 Billboard Chart at #95. On September 20, Charice will also release "Pyramid" as a single in the UK, with her self titled album following later in the year. Watch out for Charice on the United Kingdom Albums soon and maybe on the European Hot 100 and European Albums as well. 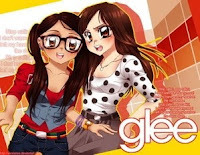 Most exciting happening this week though is the September 21 premier episode of Glee Season 2 with Charice as Sunshine Corazon set to sing a duet with Lea Michele's Rachel Berry on "Telephone" and will also belt out "Listen" originally from Beyonce. Expect "Listen" and "Telephone" to chart in next week's Billboard Hot 100. They will be credited to "The Glee Cast" though, but can mention them here too. 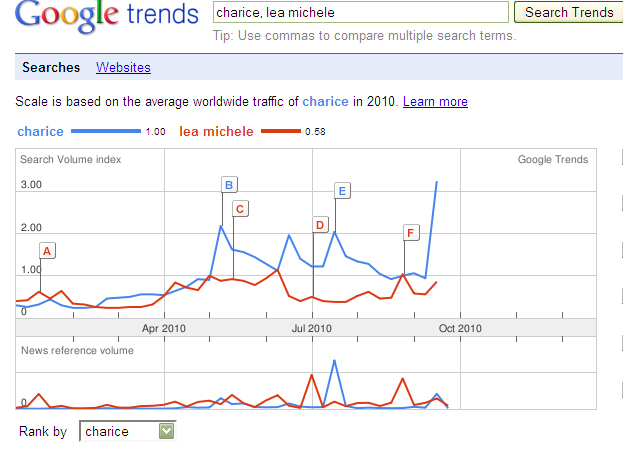 Charice trumps Lea Michele on Google Trends, proving she's the international online phenomenon that she is. The Chart below shows Charice Google searches spike after the Glee Season 2 premier. Billboard: 21 under 21 - Music's Hottest Minors - Billboard selected 21 start up stars "not only for their tender age but also for their potential to rule the pop culture zeitgeist over the next 12 months." "Telephone" - credited to the Glee Cast, but on the show was sung by Sunshine Corazon and Rachel Berry debuts at #23 on the Billboard Hot 100 Chart. It is also #11 on Digital Songs and #17 on the Canadian Hot 100 Chart. It is the 2nd biggest debut song this week next to "Empire State of Mind" which was also from the Glee Cast. "Listen" - credited to the Glee Cast, but on the show was sung entirely by Sunshine Corazon who is played by Charice, bows at #38 on the Billboard Hot 100. It also charted #19 on Digital Songs and #51 on the Canadian Hot 100. It is the 4th highest debut song on the BB Hot 100 this week. Moreover, "Pyramid" featuring Iyaz was recently released in the UK and debuted this week on the European Hot 100 at #58! Congratulations Charice on conquering the European charts! Sunshine Corazon vs Rachel Berry Anime! Charice returns to Glee on the 7th episode, this time as a member of Vocal Adrenaline. Charice will return to Glee earlier than the schedule I announced last week. She will return in episode 6 which will be titled "Never Been Kissed", and this will air in the week following episode 5 "Rocky Horror Show" next week. She was earlier rumored to be performing "Burn" but no reports so far of what songs she will be doing. Also, would like to share with you below, a clip of Charice and Ne-Yo singing an earth shattering rendition of Michael Jackson's Earth Song during the Las Vegas leg of "David Foster and Friends" that also included performances by Donna Summer, Chaka Khan, Natalie Cole, Seal, and American Idol Ruben Studdard. Charice is still not in the BB Charts this week, but she's been very busy with the David Foster and Friends Tour which made it's stop in Manila on Oct 24. 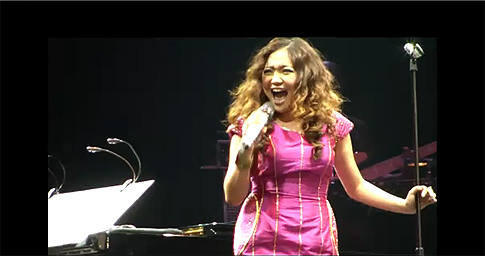 Playing to about 10,000 people at the Araneta Coliseum together with Natalie Cole, Peter Cetera, Ruben Studdard, The Canadian Tenors, and of course, Mr. David Foster, Charice blew the coliseum's roof off with her renditions of "Power of Love", "To Love You More", and a medley of songs from "The Bodyguard". 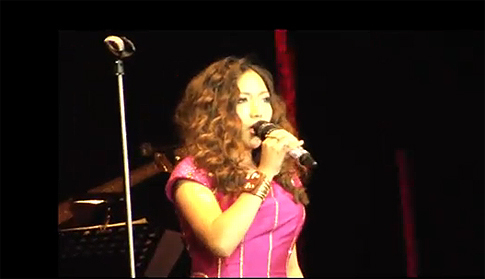 Charice also sang her hit song "Pyramid". Charice hugs David Foster after singing a medley of Whitney Houston songs from "The Bodyguard"
No news on Charice in the Billboard Charts this week, but NBC has confirmed that Charice is included in the lineup of performers for the 13th Annual Christmas in Rockefeller Center special. Big name stars Mariah Carey, Sheryl Crow, Josh Groban, Jessica Simpson, Annie Lennox, and Kyle Minogue are slated to perform. Also in the lineup is international Britain's Got Talent phenomenon, Susan Boyle. Catch it in the USA on NBC at 9 p.m. on Nov. 30. Also happening this week, the much awaited return of Sunshine Corazon in the Season 2 of Glee episode titled "Never Been Kissed". I better prepare to check what Charice songs will chart on Billboard next week. While we wait for Charice's new album and single to drop (news reports say she's working on a new, more upbeat song right now! ), we also eagerly await her return to the small screen as Sunshine Corazon. So who else was disappointed that Charice was not on this week's episode of Glee titled "Never Been Kissed"? "...dude I'm half pinoy through and through.."
The Pinoys are taking over Hollywood eh? Moreover - Go on over to Billboard.com and VOTE for CHARICE's album on Readers' Poll: Best Album Of 2010. Click the button beside Other and write 'Charice' by Charice then click Submit. "Success! Thanks for voting. Come back in December to see what albums Billboard.com's readers voted to be the best." What are you waiting for? Visit: Readers' Poll: Best Album Of 2010. Gin Blossoms frontman recently said in an interview that he thinks Charice is "extraordinarily hot" and that he looks forward to her Maxim cover shoot. What do YOU think? If you haven't yet, go on over to Billboard.com and VOTE for CHARICE's album on Readers' Poll: Best Album Of 2010. Click the button beside Other and write 'Charice' by Charice then click Submit. Watch Charice answer your questions on the Billboard LIVE Q&A on Monday, Nov 29, 4PM Eastern Time (that's Nov 30, Tuesday at 5:00AM in the Philippines). You can now start sending in your questions - just Tweet your questions to @Billboarddotcom and include a #bbcharice hashtag. Updated Week of December 11, 2010 - Pyramid 4th most searched on Yahoo! Following Charice's performance at the star studded event in New York City's Rockefeller Center with Mariah Carey, Susan Boyle, Kylie Minogue, Josh Groban and Sheryl Crow, she is now featured in Yahoo! 2010 Year in Review with "Pyramid" as the 4th most searched song for lyrics in 2010. Moreover, Charice is featured in a documentary on Teen.com called "30 Days with Charice" following her from Calfornia to New York to Manila. See the trailer here: Spend “30 Days With Charice” in Our Brand-New Web Series! 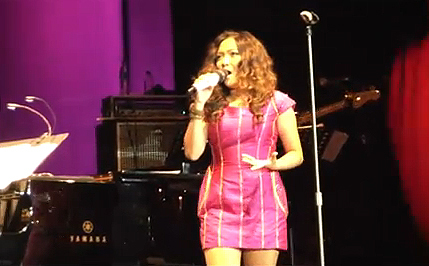 Charice sings "The Christmas Song"
This song has taken the #1 spot on iTunes Japan R&B Charts! Charice's #1 Song on the Billboard Dance/Club Play Songs Charts is #17 on the Year End Charts! Charice's album, single crack Billboard charts!